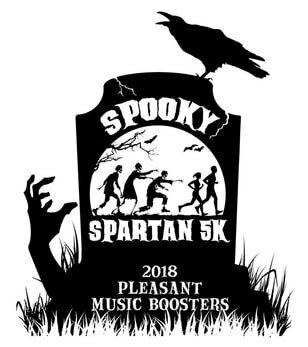 Everyone is invited to the fifth annual “Spooky Spartan 5k” run/walk through Pleasant Township Park in Marion. Celebrate the fall colors with your friends, family, and fellow Spooky Spartan walkers and runners on October 27, 2018 at 9:00am. Entry fee is $20 per person and entitles you to a race t-shirt and refreshments. Students (K-12) can participate in the Spooky Spartan 5k for $15 per person. Kids Fun Run follows the 5K at 10:00am – $1 Fun Run only and $12 Fun Run with t-shirt. Proceeds will go to support the Pleasant Music Boosters.